Mercury receives his qualities from the Greek god Hermes. He is the son of Jupiter and Maia. 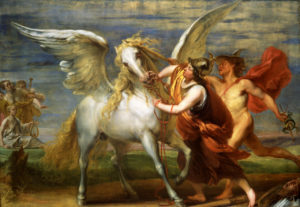 He is known for being inquisitive, young, cunning and the swift-footed winged messenger in Greek mythology. He roams freely between the underworld and above, taking and receiving messages and is the only Olympian god that had this ability. 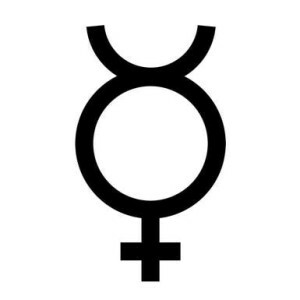 Mercury (merchant/ise) is associated with all matters of communication and the mind (how the mind is wired) such as writing, publishing, thinking, speaking, reason, logic, knowledge, and intellect. Due to his wings also with travel and transportation of goods, roads and transport. He is the merchant, trickster, fast and adaptive. Mercury governs the central nervous system, automatic processes of the body and the adaptivity of the brain to the environment through the neural network of the muscles. Ailments are anxiety, nerves, eyes, bronchial tubes, speech, hearing and respiratory organs as well as the gut. Gemini (communication and curiosity) and Virgo (knowledge and analyses) are governed by Mercury.